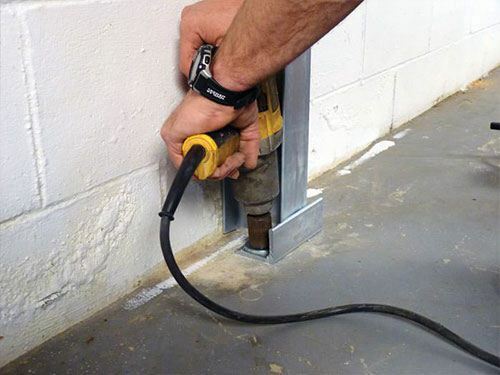 The PowerBrace is designed to support basement walls and is a patented system that allows for tightening/straightening of the walls over time. That means it can actually improve the condition of the wall over time, unlike other I-Beam systems. 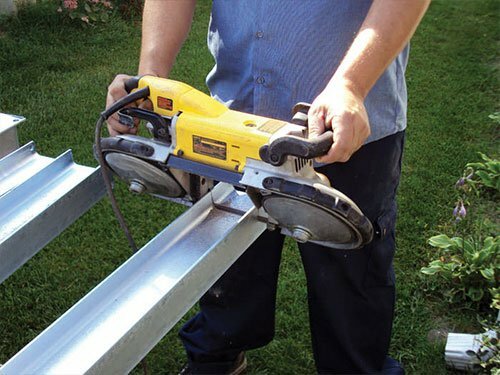 This is an ideal repair option if there is limited space between property lines, underground obstacles, or extensive above-ground obstacles that make outside digging difficult or impossible. Call TerraFirma today to find out if this is the best solution for your foundation needs. We'll provide you with a thorough onsite inspection and can answer any questions you have about your home's foundation and the PowerBrace system. How Does The Powerbrace basement wall repair system work? The PowerBrace wall repair system combines steel I-beams with engineered steel brackets. 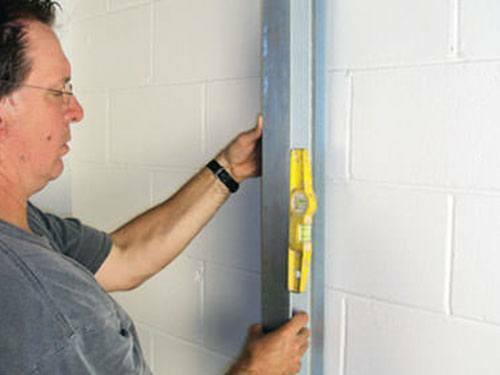 A typical PowerBrace wall repair includes a series of I-beams installed vertically at regular intervals along a wall that has bowed or tilted inward. Since the PowerBrace system is installed inside the foundation, it's much less expensive than repairs requiring exterior excavation and wall demolition and reconstruction. It's faster and less disruptive too; most PowerBrace repairs can be installed in a single day. Each PowerBrace I-beam is installed with two steel brackets. 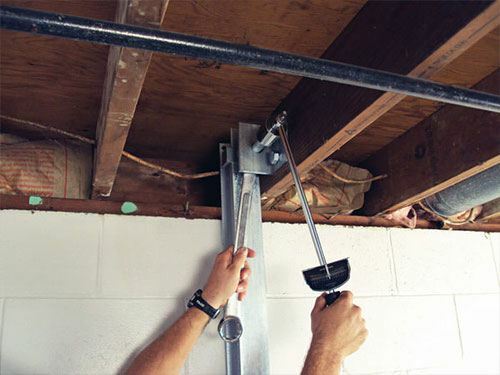 The lower bracket attaches the bottom of the I-beam to the basement's concrete slab floor. 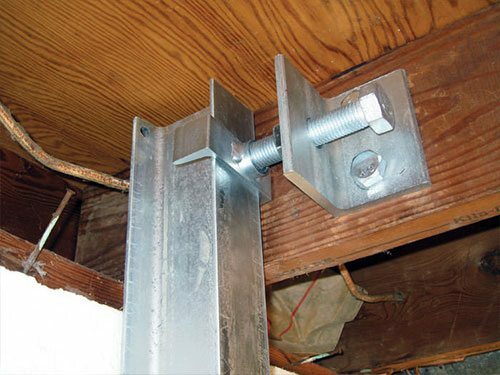 The upper bracket mounts on the wood floor framing of the home's main level and includes a large-diameter bolt that forces the I-beam against the foundation. By gradually tightening this bolt, the foundation can be incrementally pushed back toward its proper position, completing the repair process. Based on the wall height of your basement, we will cut each beam to the appropriate height. The PowerBrace™ Foundation Wall System is fine-tuned to its best position in preparation for the next step. Each beam will be attached to your concrete foundation floor with a special, bolt-in-place bracket. The PowerBrace System can be tightened at intervals for possible wall improvement. The PowerBrace™ has a patented system that allows for tightening. That means it can actually improve the condition of the wall over time, unlike other I-Beam systems. When you select the PowerBrace™ you receive a 25 year warranty against manufacturing defects and a performance warranty. Zinc Coated Beam and Components. Zinc coating makes the entire system resistant to corrosion, reduces abrasion and wear, and creates a non-toxic surface. The PowerBrace is zinc-plated in accordance with the American Society for Testing and Materials (ASTM) B633 standards for zinc coatings on steel. Many steel beam systems offered by other contractors use black, uncoated steel or painted steel. Unprotected steel offers very little resistance to corrosion, resulting in a rusty and unsightly system in your basement. While this should seem obvious, there are many contractors out there installing beams haphazardly. In order to maintain the integrity of your floor system, it is critical that the connection of the system into the joists be performed properly. PowerBrace utilizes a joist reinforcement method which distributes the load evenly as not to damage your wood floor system. When installed properly and in the right application, there is not another I-Beam system available that offers the benefits of PowerBrace. The Experts at TerraFirma Foundation Systems can Help! If you're not sure of the source of your foundation problem, give us a call 866.486.7196 and schedule a free inspection. We'll find out the cause of the problem and help you find the perfect solution. Your home is precious. It's where you grow your family, welcome friends, and create lasting memories. Nothing should stand in the way of that. As your basement walls begin to crack, bow, and lean inward, the very foundation from which your life is built becomes compromised. Finding a permanent solution that addresses the true cause of your foundation problem is the surest way for you to get on with your life's happenings and enjoy peace of mind. How did your walls get this way? As forces of nature, such as moisture and frost, interact with the soil around your home, the soil expands. That expansion results in constant inward force on your foundation wall until it can no longer support the pressure, causing cracking, bowing, and tipping. The patented powerbrace system exclusively from Foundation Supportworks, Inc. permanently stabilizes your home's foundation walls. 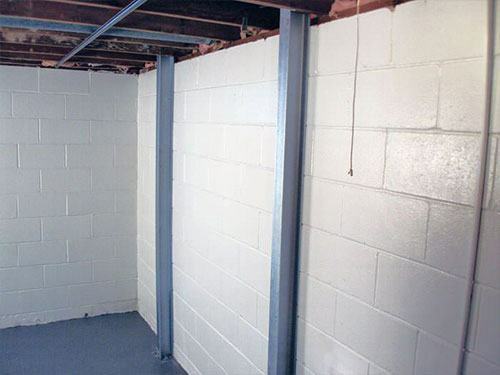 Zinc-plated steel beams are custom-fit to your basement wall height and secured tight against your basement wall with brackets anchored to your basement floor and floor joists. PowerBrace's unique, patented design allows the system to be tightened over time, potentially reversing wall failure without any invasive drilling or digging on the property. PowerBrace Systems are installed year-round, often in less than one day. Restore your property value and enjoy peace of mind right away. Rest assured that the PowerBrace System will immediately stabilize your foundation walls and permanently protect them against any further movement. The PowerBrace solution comes with a 25-year warranty against manufacturing defects and a performance warranty from your local dealer. 761 NE Garden Valley Blvd.